Scourge of the Betrayer, the first book of the Bloodsounder's Arc is the debut Fantasy novel of Jeff Salyards. It was released on May 1st 2012 and as you can tell, it's the first part of a series. The author described his work as hard-boiled Fantasy or as a more intimate Fantasy than Epic. In any case, the novel is among my favorite debut of the year. Hired to chronicle the exploits of a band of rugged Syldoon warriors, Arki finds himself both frightened and fascinated by the men's enigmatic leader, Captain Braylar Killcoin. A secretive, mercurial figure haunted by the memories of those he's killed with his deadly flail, Braylar has already disposed of at least one impertinent scribe...and Arki might be next. If you are already mindful of Salyards' book, you might know that his name has been associated with Joe Abercrombie, Richard K. Morgan or Glen Cook. For the first two names, the comparison is mainly because of the grittiness, harsh dialogues or remarks and sometimes graphically violent side of the author's book. As for Cook, even if he also writes his share of grittiness, with his Black Company series, he specialize in mercenary Fantasy, which is also a big part of Steven Erikson novels and, more importantly, in first person perspective writing. 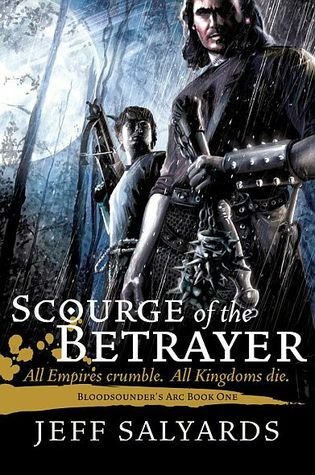 I don't think that Scourge of the Betrayer is a book as provocative as Morgan's A Land fit for Heroes series or as gritty as Abercrombie's works but he uses the same elements skillfully to a certain degree. Moreover, if you love the Black Company, I can guarantee that you'll find your satisfaction in Salyard's novel, yet, in a distinctive way. As I mentioned on previous reviews about first person perspective narrative in Fantasy novels, this is one of the richest form of writing but then everything falls on the shoulder of one character and the compelling nature of all the other protagonists depend on his observations, insights and interactions. Croaker in Glen Cook's novels is so special and so compelling that it works stunningly well. Arki, the young scribe is not Croaker, he is a completely different kind of fellow. He's out to see the world, to make a name for himself and there's a score of emotions and experiences he has yet to live to form a real edification. His open-mindedness will take a different shape and the struggle between the endeavor's collaterals he has unconsciously signed on and his inner feelings of justice create a smoother balance in the recounting of brutal and uncompromising events. The Syldoon warriors the scrivener is accompanying are more typical on the surface. A bunch of highly skilled elite troops who have seen much blood, death and battle and who formed a strong fellowship under stark command. However, there's much more to them than what they show and tell young Arki. Sometimes it's hard for him and consequently for the reader to be left in the dark but suspense requires it! Moreover, it makes him work that much harder to become accustomed to them and learn their story. They eventually show the darkest, funniest and strangest side of themselves. Hopefully, that's where magic find its roots, mainly in a memory-centered concept where the author only scratches the surface. That whole magic system needs more exploration, it seems like an interesting premise. Scourge of the Betrayer is a short book but it doesn't feel like a short read, efficiently bringing the satisfaction of a complete novel but still delivering a dose of eagerness for more. At times, it feels like a prologue to a grander tale or a prequel explaining the start of some distinguished relationships or an origin story. Ian C. Esslemont's Night of Knives felt the same for me in term of setting the characters and exploring storytelling for a new author. Among the aspects I preferred in Scourge are the battle descriptions but mostly the performances or progresses of them. Brayard, the Syldoon Captain is skilled but he's not killing everybody with a well-placed stroke coming of nowhere. His enemies are usually well armored so he has to use much cunning, perseverance and techniques to finally get 'through' them, and then, harm also finds its way to him. It's read as a savage choreography seen almost in slow motion where every move is described and interpreted. Mr. Salyard's writing is straightforward. Some of his characters have a peculiar way of speaking and his turns of phrase are somewhat 'singular'. There are only a couple of chapters divisions and everything and I mean everything is detailed, a chronicle of every moments of the span of time covered in Scourge. From the first encounter of Captain Killcoin and Arkamondos to their nights at the inn, from the road to the city Alespell to the machinations undertaken by the Syldoon in the city, there's only a dozen days or so going by and we are witness to all of it. That's an intriguing way to tell a tale. However, it creates some really great moments, full of expectancy. Taking all of this into consideration, you get a story recounted by an honest, untested and original narrator who makes it more than real. The atmosphere is vivid, murky but enveloping. I could easily imagine myself standing side by side with Arki. I'm not even sure the word imagine is the right one, I could feel the scenes. Great work! Technically, the Night Shade Books cover is interesting with very representative depictions of the two main characters with its own art style. The only weird thing is the faces..., looks like some kind of wax masks. The hardcover edition of the novel stands at 255 pages. Sadly, no map is included. @Jeff: A map! Hurrah! :) Thanks for stopping by! An excellent read Jeff! Couldn't stop reading. You got me hooked. Thanks, Dom! So glad to hear it.